The holidays are fast approaching. Many of us are looking to bring kids and adults around the table to create new memories. We’ve asked our content contributors to give us two games that they’re bringing to the table during the holidays. This list is made up of games that are multi-generational and fun for players at almost any level of game experience. Azul is a tile placement game that’s easy to teach and beautiful to look at. Each player takes turns choosing like colored tiles off “factory” locations in the middle of the table. Filling in rows of identical tiles allow you to place the tiles into the mosaic on their player board. Depending on how you arrange your tiles, you can rack up massive points at the end of the rounds! Azul plays really well with two to four players. I taught it to co-workers recently and they caught on quickly and couldn’t get enough! We played it many time during our Easter family get together, and I know they’ll be asking for it again when we show up for Thanksgiving. Wits & Wagers is an awesome blend of risk taking, betting and trivia! It’s exciting, loud, and can support a large group of players. A trivia question is asked at the beginning of each round, and players secretly write their answers (which are always numerical) on a small whiteboard with a dry erase marker. They submit them face down on the playmat, and once all answers are in, the whiteboards are flipped over. All answers are placed in order from lowest to highest, with payouts based on the difference between the highest and lowest numbers. 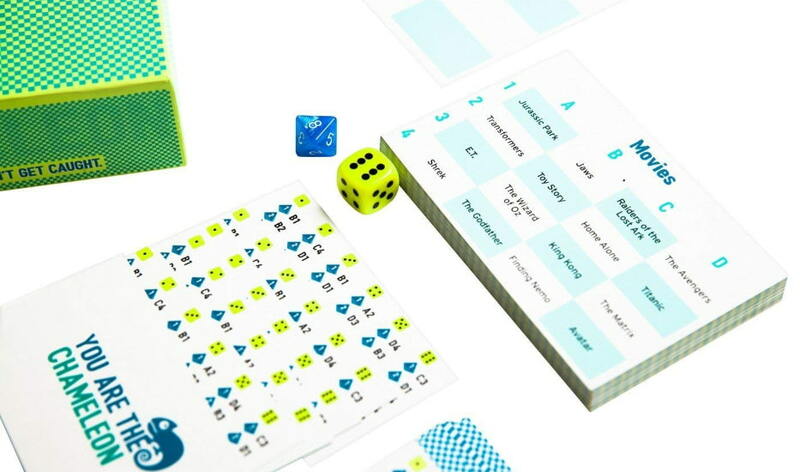 Each game consists of eight rounds and takes about 30 minutes to play. A unique aspect of this game is that you don’t have to place a bet on your own answer. If someone submits an answer that you agree with more, you can place your bet on that one instead! Extensive knowledge of trivia is not needed for this game. It’s fun just to see the answers your friends and family will come up with! Wits & Wagers is fun, entertaining, and appealing to crowds of all ages. You can find it in several editions, including Party, Vegas and Family. Check it out for your Thanksgiving and Christmas family get together! I occasionally get feedback from people about how they went out and bought games that we recommended and then had a great time with them. It always makes me happy, because that’s what we’re here for! But then sometimes I keep talking about a game and no one ever talks about it, and I start to worry that none of you are paying attention! That’s the case with Liar’s Dice. Liar’s Dice has been a hit every time we break it out. At a family reunion, at a church game night, with my brother’s wedding party the night before the big day. Whenever we play, people feel a little hesitant about the rules, but quickly catch on and dive into the action. The game evolves as it progresses – it starts as a game of probability and quite a bit of luck, but it transforms over the game into an intense bluffing experience. That final head-to-head matchup is amazing, as each player tries to outwit their opponent and the final reveal leads to cheers of celebration and moans of disappointment. I think it’s the perfect game after meal game for the holidays that will get young and old to the table together, enjoying a fun-filled evening of dice, dice, and more dice! This is a game that we got to demo at Origins back in June, and with its release a few months ago, you now have the chance to join in on this poker-based thrill ride. In Most Wanted you are all bandits, looking to become the ‘most wanted’ rascal out there. Hooray for infamy! You complete villainous actions like robbing a stagecoach or holding up a bank by playing matching sets of cards. The deck goes from 6 to ace, and highest set wins, EXCEPT that sixes win if someone plays a set of aces. The gameplay is easy to pick up and familiar to most people who’ve played any sort of poker-like game with a regular deck of cards before. You have other options on your turn where you can draw new cards to try to prepare for a later hand, but all of the action takes place when players go up against each other for those infamy points during a robbery. Another option – duel – enables you to challenge one player head-to-head. This provides a somewhat unfair experience for anyone that jumps out to an early lead, but you’ll all be laughing about it, so it doesn’t really matter. Overall, it’s a fun, light-hearted game that features a nun with nunchucks. What’s not to love? Drawing and art games can be incredibly intimidating. You’ll hear “I can’t draw” or “I can only make stick people”. You don’t need an art degree in order to play Bob Ross: Happy Little Accidents from Big G Creative. Players are given slips of paper to draw a single squiggle or line on. Those random lines are then incorporated into drawings by other players at the table. The cards in the game give players the prompts needed to draw mediocre creations. The whole game takes about 15 minutes and plays up to 6 players. This game is silly fun with no game experience needed. Every time we play, kids and adults are laughing at the different drawings that people come up with. The card prompts with inspire lots of different ideas no matter what your level of creativity is. After 3 rounds of drawing, players use their color Bob tokens to secretly vote for their favorite drawing submitted by each player. We probably won’t attend a family gathering this year without our artistic friend Bob Ross in our bag. I would never refer to myself as a fan of racing or cars. That’s why it was so surprising when Downforce from Restoration Games was one of my most played games of 2017. Downforce is more than moving a car around a track. Players are betting on the car they think will place in the top 3 spots by the end of the race. Using a hand of cards, you have control over every car on the board and every space counts as you compete. Downforce will travel with me this holiday season because it takes 5 minutes to teach, 30 minutes to play and it’s super rare that we only play one game. Last Thanksgiving we played 6 games between lunch and dinner with the relatives! Kids over the age of 7 have picked up this game pretty quickly. The cars and maps are colorful and fun. The rule book even includes modified rules if you’re playing with really young gamers at the table. Now that we have the Danger Circuit expansion for Downforce, I can guarantee the extended family will be hugging the corners of the track just as much as they hug necks. I feel as though I am applying the old adage “if you can dodge a wrench, you can dodge a ball” when being asked by someone if they can play Drop It. If you can pick up pieces and drop them, you can play Drop It. The 2017 release by Komsos Games has been a complete hit in my personal opinion. The game is easy to explain, easy to setup, easy to play, but still maintains that player tension for excitement. Drop It will have you taking the shapes of one particular color and dropping them into a standing upright game board. During game setup, you may adjust the board to have variable scoring options based on what shape you drop where, and which color is dropped where. Drop It supports 2 – 4 players and scales down to each player count extremely well. I guarantee you when you put this game on the table for the holidays, your family will drop everything for Drop It. Everybody loves a good game of hide and seek, and The Chameleon by Big Potato Games will let you do just that, in plain sight. The Chameleon is great for large gatherings during the upcoming holidays as it supports 3 – 8 players. There are only a few rules, which helps while trying to explain to large crowds. Everyone on the table will get dealt a player card that contains a map. The map will guide you in referencing a topic card that has 16 terms on it related to a topic. Topic may range from cartoon animals to historical figures to cities. The topic card will be placed after everyone has received their map. One player card dealt to a player will contain no map but will say “You Are the Chameleon.” All cards dealt are to be kept secret. There are a set of dice which will be rolled by the starting player. This will direct everyone on the table to reference their map. Everyone will know what word they are supposed to know about, except the chameleon. Then, in player turn order, each player may say one word, just one. A word that will signal everyone else on the table that they know this specially chosen word/phrase on the location of the topic card, but a word not so specific that they give away the location to The Chameleon. The chameleon will have to perform the same task when it is their turn and say a word. As the chameleon, do your best to hide and say a word that correlates to what you think everyone else is talking about. After everyone has said a word, there will be a short deliberation period where everyone accuses someone of being The Chameleon and lays out their best accusatory theories. When everyone has decided who they are voting for, a simultaneous vote will be cast by pointing at the offender. The person with the most votes must turn over their player card as they have been called out. Points will be scored based on The Chameleon escaping, or being caught but guessing where everyone is on the topic card. This game is hilariously fun and can get loud and involved with the right holiday crowd. It is a party hit and I would highly recommend The Chameleon for your holiday family gatherings.